Stylish modern interiors and first-class amenities will impress you from the moment you step into your Deluxe Premium Room. Designed to reflect pure elegance and tranquillity, earthy colours mix with black and white to set a classy vibe. Don’t stress about how you’ll get there! We include all the essentials, so your return airfares and luggage are sorted – just pack that 7kg bag and head to the airport! To upgrade your luggage allowance just ask our Holiday Experts. 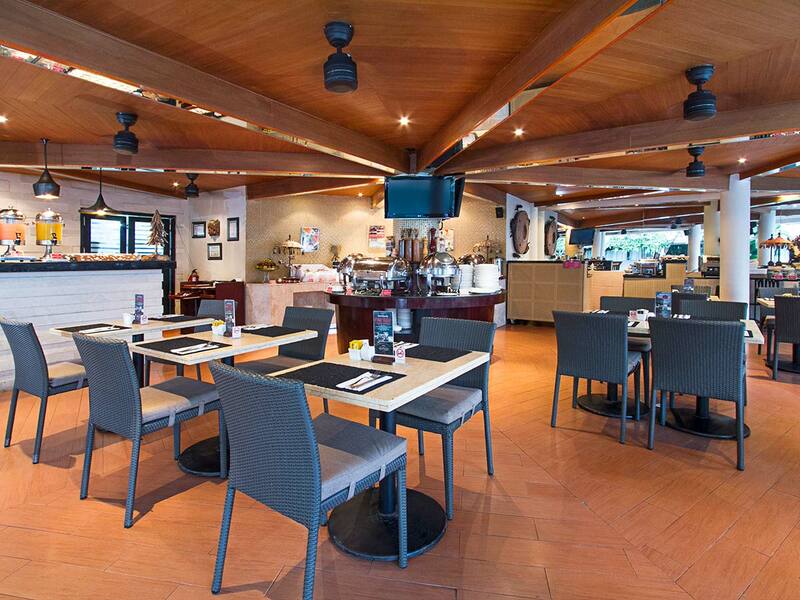 Enjoy a buffet breakfast each morning for two at Azaa Restaurant! Start your day with a delicious meal consisting of locally sourced foods that will provide you with the fuel you need for a day full of activities and relaxing! Feast on this! During your stay, enjoy a mouthwatering themed buffet dinner per person at Azaa Restaurant! So take a seat, relax and let the talented chefs at Away Bali Legian Camakila spoil you! Get pampered with us! Rejuvenate your mind, body and soul when you visit Bali this holiday. 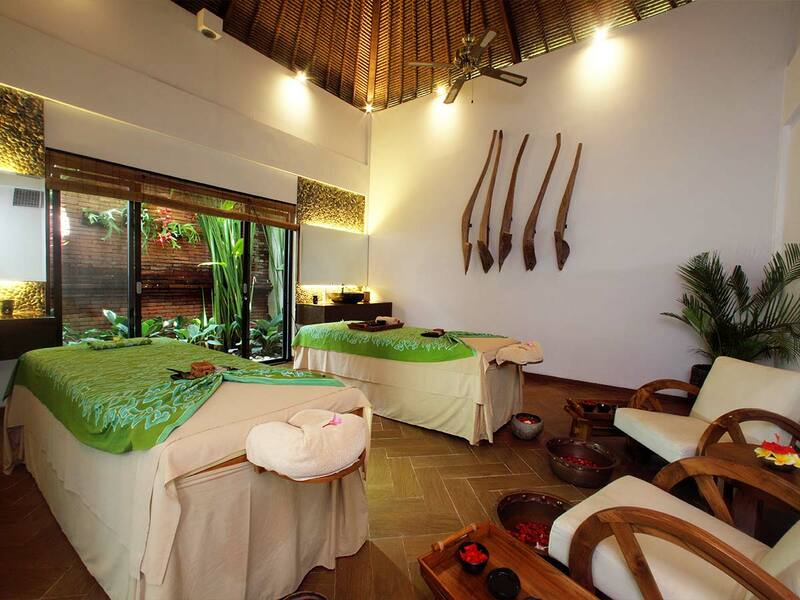 Indulge with a 1-hour massage for two at Salila Spa during your stay and feel your tension completely melt away! The last thing you want to do on your holiday is stress about how you’re going to get to and from the hotel. Enjoy return airport transfers on us to start and end your holiday in the same way—at total ease, completely relaxed! We know how much everyone loves a cold drink! 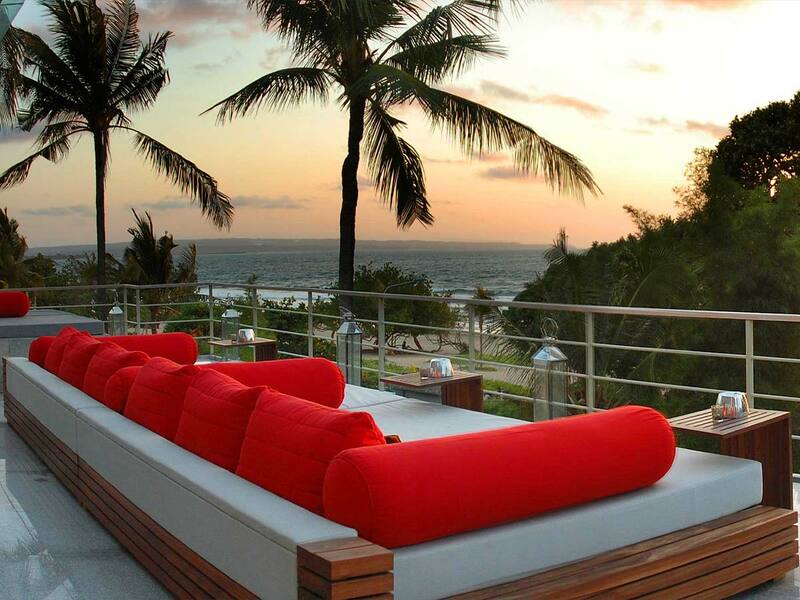 Watch the sun go down as you enjoy a cocktail or two at Roof Bar on us! Don’t just experience the tastes of Bali, learn how to create them yourself! Enjoy a cooking class and lunch for two at the resort this holiday when you stay at Away Bali Legian Camakila! Holidays end way too soon! Forget rushing around, trying to get everything packed— have a lazy breakfast, take a dip in the pool, walk along the beach and more. You’ve got until 2pm so make the most of it! We all get a little thirsty after a flight and there’s nothing that says ‘holiday’ like a cold drink on arrival! Making the most of your holiday straight away is easy with a drink in hand, so sip away after checking in. Check-in, upload and report home. With complimentary internet, you can become the envy of all of your friends. Show off just how good your holiday is—whatever social platform you use, update it to your heart’s content. Stunning views of sunrise or sunset against the vast sea and clear blue skies are what Bali holiday dreams are made of. 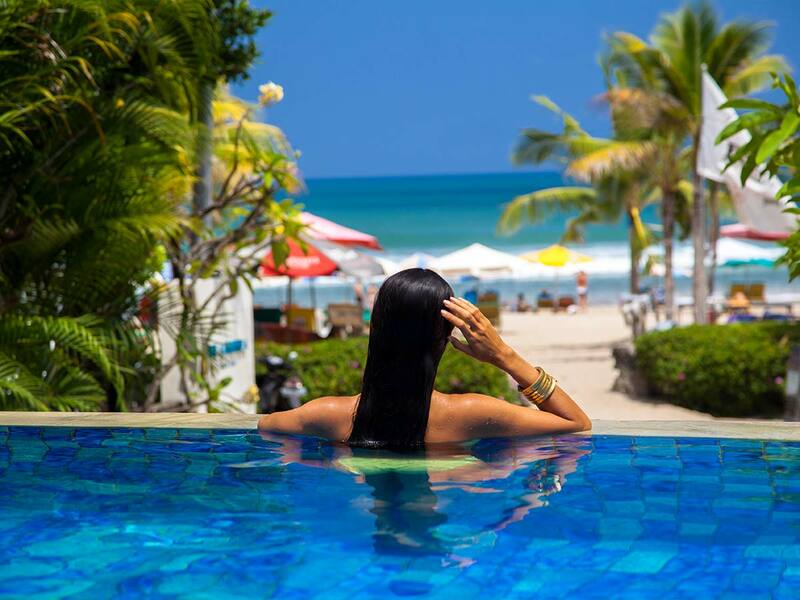 Experience this bliss and more when you stay at Away Bali Legian Camakila. This 4-star property is located in the heart of Kuta Village, between a shopping and entertainment mecca and the Legian Beach. Guests who are arriving at Ngurah Rai International Airport will reach the resort within a 23-minute drive. Seminyak’s upscale market is only 6-minutes away from the property. With so many attractions and beach activities near the resort, what more could you ask? Whether or not you and your loved ones are visiting Bali for the first time, you all deserve accommodation that is set right on the beach and picturesque views of the Indian Ocean day in and day out. 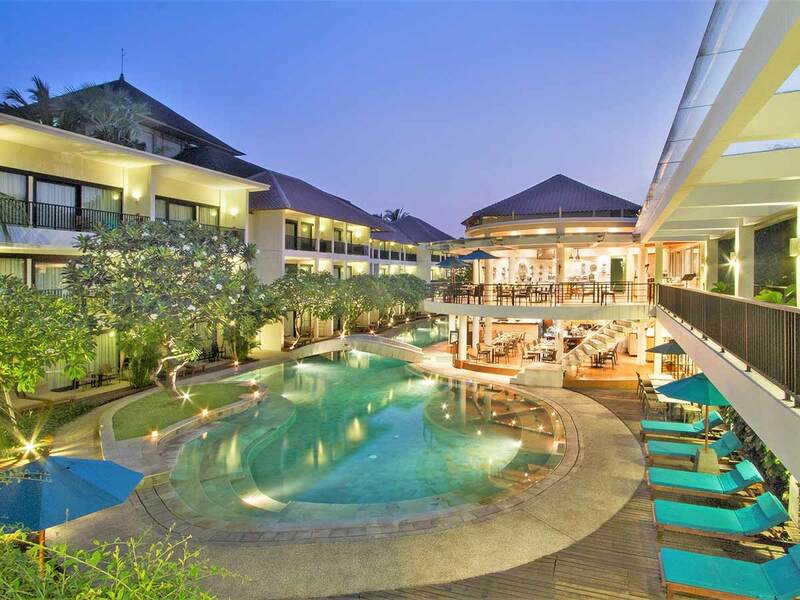 Away Bali Legian Camakila offers just that, in addition to world-class facilities. 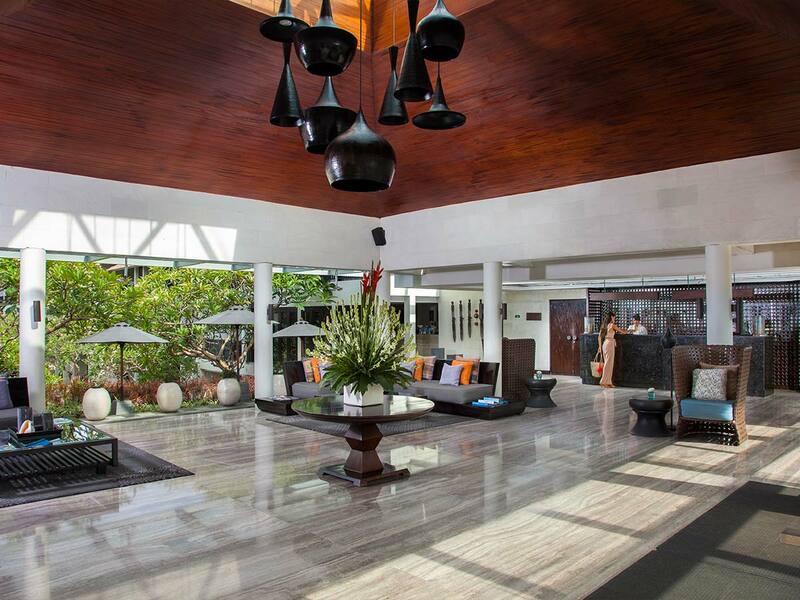 Also, expect a fusion of Balinese art and modern interiors as well as a relaxed coastal ambience. Enjoy a refreshing morning swim in any of the 2 outdoor pools, keep up with your workout regime at the well-equipped fitness centre, satisfy your seafood cravings at the poolside restaurant and bar, and do not forget to treat yourself to an invigorating spa massage! 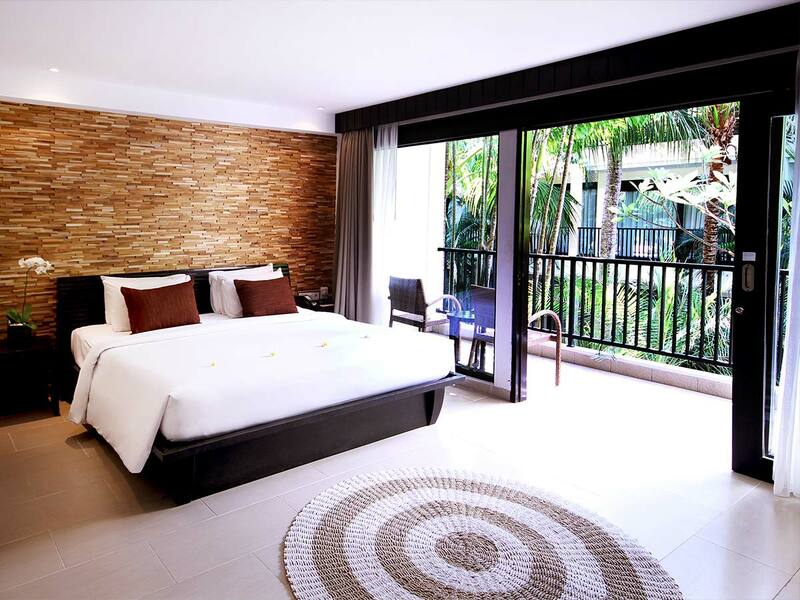 At Away Bali Legian Camakila, your spacious accommodation consists of complete entertainment and leisure amenities, from flat-screen TV to lavish spa bath. The private balcony overlooks the landscaped gardens of the resort. 9 Months interest free available from $40.98 per week for two people ex Perth. Prices are correct at the time of publication, are twin share per person, may change without notice & subject to availability. Restrictions & conditions apply. See website for full terms, conditions & travel dates.  Prices quoted are on sale until 15 MAY 2019 unless otherwise stated or sold out prior. Seasonal surcharges & blackout dates may apply depending on date of travel.